Your Lyme Disease Symptom Checklist was successfully submitted. You will receive an email with a pdf attached that you can print out and take with you to your next doctor’s appointment. You may also download the pdf below. Please know that the information contained in the Symptoms Checklist is for educational use only. It should not be used as a substitute for professional medical advice, diagnosis or treatment. Share your checklist responses with your physician to determine if you or your child have Lyme disease. Please consider taking a short survey. LymeDisease.org is the most extensive communications network for Lyme disease and the most trusted source of information by patients. Our big data project, MyLymeData, is the largest study of Lyme disease ever conducted. Please answer the 3 questions below to help us improve our work. Do you have suggestions or comments regarding the Symptom Checklist? 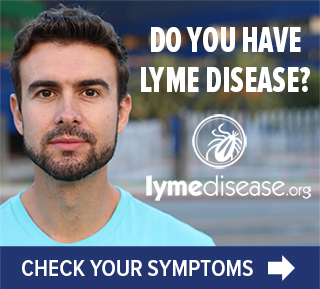 If you have a website, you can help by posting a Lyme Disease Symptom Checklist banner on your website. If the size below does not fit into your website design, we will make a banner to fit your dimensions. Email us at info@lymedisease.org to let us know your custom size. Delay in diagnosis is common. Approximately 60% of patients with chronic Lyme disease are not diagnosed for at least 2 years. Diagnostic testing for early Lyme disease (within a month of exposure) is widely considered unreliable and is not recommended by the CDC because patients have not developed the antibodies the test detects. In late Lyme disease, antibody levels may decline. Roughly 50% of negative Lyme tests are false negatives. In Lyme disease, there are two standards of care reflected in the medical guidelines of two specialty societies: the International Lyme and Associated Diseases Society (ILADS) and the Infectious Disease Society of America (IDSA). The differing guidelines reflect largely the poor state of laboratory testing for Lyme disease. The ILADS guidelines permit the exercise of clinical judgement by the treating physician, while the IDSA guidelines restrict treatment options. LymeDisease.org recommends that patients be informed about both standards of care and in consultation with their physician, determine the best treatment approach based on their individual circumstances. If you have Lyme disease, please participate in MyLymeData. Stricker RB, Johnson L. Lyme wars: let’s tackle the testing. BMJ. 2007 Nov 17;335(7628):1008.